The Ronson Newport was first manufactured in 1947 and the production went on till the late 1950's. 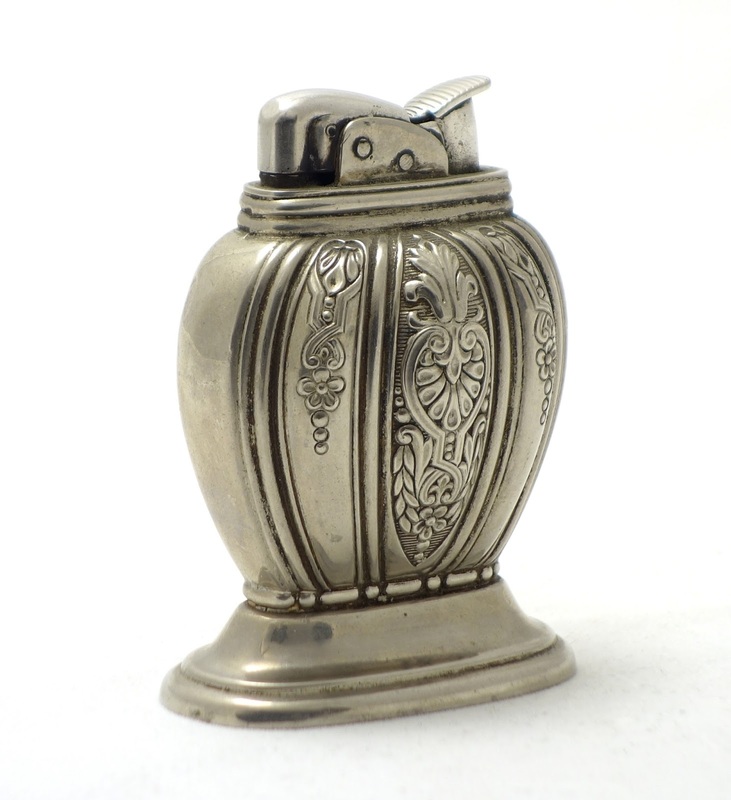 This wick lighter was available in three different finishes: silver plate, gold plate and rhodium plate which is rare. Also sold as a pair. The pattern used at the bottom of the base is very similar to that used in the Ronson Juno table lighter. The Newport has an elliptical base which is padded with green felt. It is heavy and covered with a transparent lacquer in order to avoid tarnishing. A Japanese knock-off was made by Royal Star only in chromium plate in the 1950s. 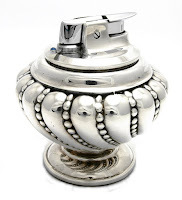 This table lighter was made by Tiffany while under the directorship of Louis deBebian Moore in 1956. The base has a simple cylindrical design in Art Deco style. It is made of sterling silver – 925 grade of silver. The lighter insert was provided by Evans (USA). It is made of brass and is silver-plated. The Tiffany Holloware Pattern Number is 23794 which was registered in ca. 1956. The Ronson Juno was first manufactured in 1950. The production went on till 1956 in Newark (USA), Toronto (Canada) and London (England). It is a very slim and tall table lighter (look at dimensions). Juno is heavy silver-plated (partly polished and satin) and uses the same lighter fitment as the Ronson Gloria and Ronson Penciliter. The lighter insert is removable. The pattern used at the bottom of the base is very similar to that used in the Ronson Newport table lighter. The base is padded with cork or green thick felt. The silver plate is protected by a transparent lacquer. The Rolstar Floral was produced only in England in 1955 to probably 1957. This wick lighter is chrome-plated and has a silver floral border decoration - there were at least 5 different floral decorations available. A nice and collectible lighter. The Ronson Queen Anne Set was manufactured in 1949 till 1954. The set consists of the Queen Anne wick lighter, matching cigarette holder and tray. 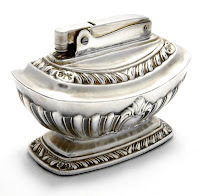 The three-piece table lighter set is silver plate and quite heavy. All of them are marked Ronson. The lighter as well the cigarette urn is padded with green felt and covered with a transparent lacquer to prevent silver from tarnish. 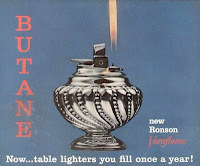 The Ronson Varaflame Crown was first manufactured in 1959 and the production ceased in 1966. It was made in Woodbridge in the United States, in France and also probably in the United Kingdom. It is a nice and heavy silver-plated butane lighter. The swirl design and name "Crown" was inherited from the Ronson Crown bestseller manufactured since 1936 as a wick lighter. The lighter insert is a typical Varaflame fitment used in many different Ronson models. 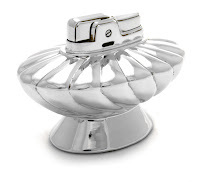 It has a fingertip flame control and is partly silver plated and partly chrome plated. The base of the lighter has a green felt pad and the silver plate is protected by a transparent lacquer. The production of this fully automatic cigarette lighter started in 1949 and finished in 1956. Evans Windsor has a chased design available in gleaming silver and gold electroplate finish (model no. 84J29). 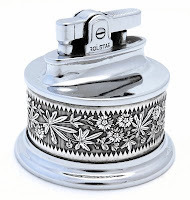 This wick lighter has very often minor abrasions on the plated surface even if it is boxed and new (old stock). The lighter is padded with green felt. This Ronson Regal is the second table lighter which Ronson give the Regal name to - see the other Ronson Regal. This handy wick lighter was first introduced in the U.S. market in 1957. It was available in two different finishes: chrome and cooper plate. The wick lighter has a very extraordinary swirl design and an Essex fitment. It has an oval base which is padded with green felt. This automatic cigarette table (desk) lighter has two different names. 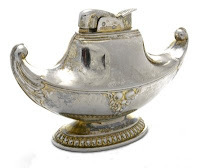 In the Evans catalog one can find the name "Magic Lamp" as well "The Famous Magic Lamp". It was made between 1951 and 1956 in the United States. It was available in two different finishes: gold and silver electroplate. This wick lighter has very often abrasions on the plated surface even if it is boxed and new, see picture. The lighter is padded with green felt. This Wedgwood table lighter was made in 1969 in England. 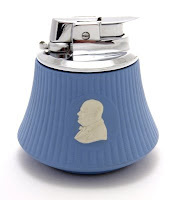 The Varaflame type fitment (variable flame control) is mounted in Blue Jasper base made by Wedgwood with a white overlay bust design of Winston Churchill on both sides. This lighter is commemorating W. Churchill - the British politician known chiefly for his leadership of the United Kingdom during World War II. The Ronson Georgian was first manufactured in 1936 and it was produced with small visual changes in the 1940's and 1950's in Canada and United States. This lighter is heavy silver plated and kept in "Georgian" style as the name of the lighter indicates. The lighter has a nicely composed monogram shield. The base has a green felt pad and the silver plate is protected by a transparent lacquer. There are two versions of the Ronson Georgian. First produced between 1936 and 1948 (Newark, N.J., USA) has a radius on the top of the snuffer cap next to the flint wheel. (see pic. below) The later one (see pic. 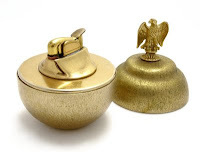 on the top) has a flat top snuffer cap and was produced from 1949 till 1954 in Canada and USA. The Napier Company is considered to be the oldest fashion jewelery manufacturer in the United States. The Napier's history can be tracked back to 1875 though the name 'Napier Company' was adopted in 1922 and since than the mark Napier in block has been used till its takeover by Victoria & Co in the late 1980's. The Napier company was finally closed by Victoria & Co in 1999. Napier cooperated with Evans in the 1940's and 1950's. They made together very fine examples of modern craftsmanship. One of its creation is the American Eagle manufactured in the 1950. Evans provided the lighter fitment which is gold-plated and Napier Co. made its shelter in the shape of an egg. On the top of it the American Eagle is sitting. The Eagle is used as a handle for opening the lid of the egg which reveals a concealed Evans wick lighter. The brushed gold plate finish looks and feels good and durable. An interesting collectors' item made with taste. This lighter was also available in different shapes (ball, apple) and handles. The base is marked NAPIER, there is also a sticker GOLD PLATE. The Hy Glo & Frank M. Whiting lighter was first manufactured in 1931. Hy Glo Products Co. Owosso, Michigan U.S.A. provided only the small sterling wick lighter insert marked: Hy Glo MADE IN U.S.A. Hy Glo went out of the lighter business in 1949 due to a fire that destroyed the whole factory complex. 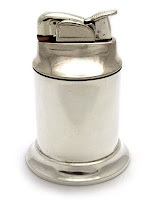 The lighter was also sold with a matching ashtray (used also as a coaster) and cigarette urn. 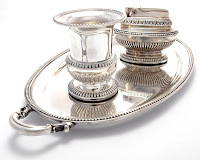 Every item of this set was made from glass (not crystal glass) and silver sterling (925). They all have a sterling plain rim with raised beading around the inside edge and marked Frank M. Whiting. The glass base of the lighter is not marked though it has an indented star bottom. 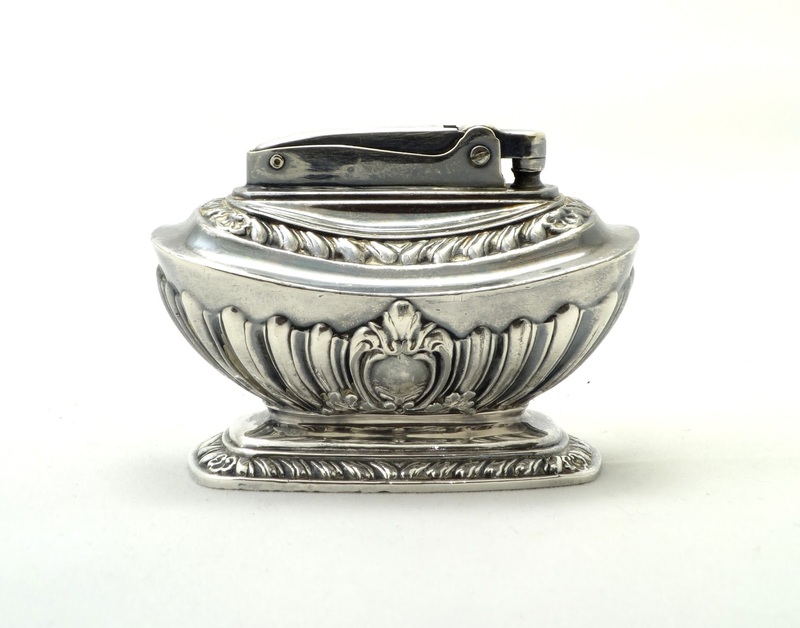 The lighter has a removable cap (top cover) made from sterling silver - there were manufactured in different shapes like the pattern of the rim varied (see here). On the market many companies made such sets among others: Strikealite Lighter Co. or Amston Mfg. Table Lighters. Worth to know is that the Frank M. Whiting was founded in 1878 in North Attleboro, Massachusetts by the son of William Whiting, the founder of the Whiting Manufacturing. In 1895, the company was converted to a stock company under the name F. M. WHITING & Co. In 1896, the firm's name was changed to FRANK. M. WHITING & Co. 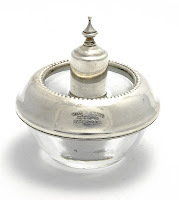 In 1897 the company was incorporated and later in the 1924 was purchased by the Elmore Silver Company of Meriden, CT. Their line included sterling silver flatware, hollowware, novelties, souvenir spoons, etc. The brand was on the market till the 1940s.